I have become quite a fan of olives and olive oil in recent years since I got the taste of Turkish olives. Now they accompany virtually every breakfast I have in Turkey. 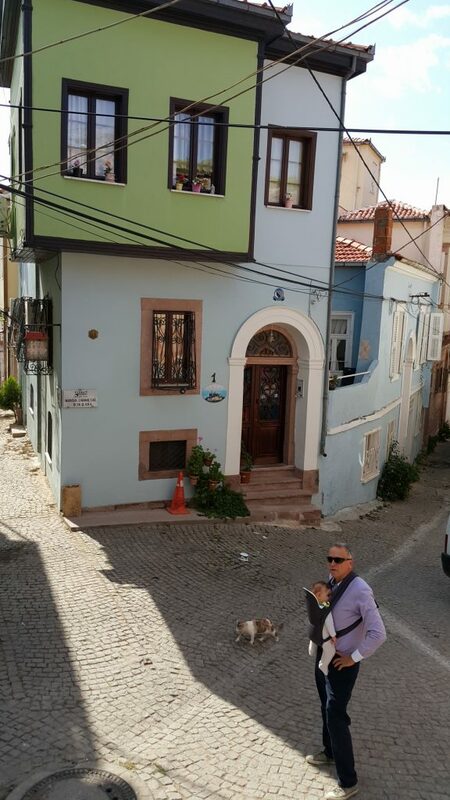 I reminisce about my latest trip to Ayvalik in early October, barely a month ago. 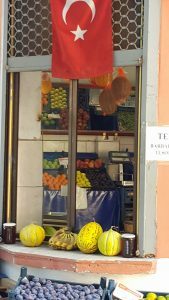 Driving through the silver-coloured olive groves, expanding over rolling hills and meadows right up to the seashores, we arrived at the small town of Ayvalik. Its lovely seaside promenade alongside small firshermen’s boats and wooden holiday sailing yachts, moored at the bay, gently swaying in turquoise waters. 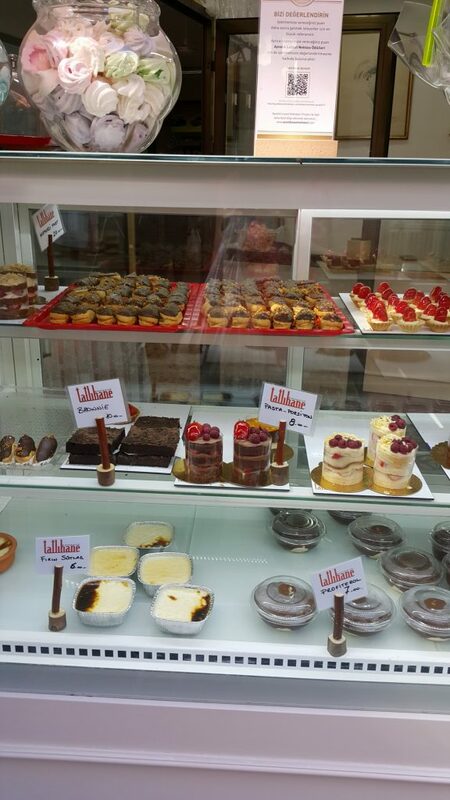 The popular promenade is lined with cafes and restaurants, small shops and cake and tea houses. We ventured further from the seaside, climbed up the hill, explored narrow streets with old wooden and stone houses, art galleries, boutique hotels, shops, eateries, homes. There is a beautiful mixture of both Greek and Turkish architecture. Many houses are lovingly restored, many still waiting for restoration. For some reason, I tend to get especially excited to see old dilapidated buildings, still bearing the aura of the bygone days, who knows what kind of stories they could tell, teetering near collapse, but still keeping upright as if to defy the gravity. At the same time I am delighted to see the houses which have actually been restored, painted in bright fresh colours, looking pretty and cheerful. Tolun insisted we climb up the hill where he wanted to show me something. 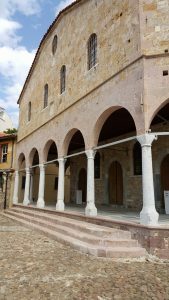 After several unsuccessful attempts at getting the right direction from google maps, he just followed his instinct and we arrived quite near the top of the hill at a lovely old Greek church, now a museum. Taksiyarhis church was the first church of Ayvalik. 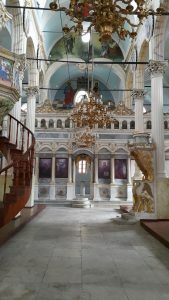 We rested on the bench in the spacious courtyard with tall and broad leafy trees (Mulberry or plane trees maybe) and took a look inside the small, quiet, colourfully decorated church, originating from the 15th century, later modified. We were the only visitors and it was nice to sit there, cool down from the heat outside and admire the beautiful artwork. Back outside, we walked downwards again, passing several mosques nearby which showed more sign of life, as it is nowadays predominantly Turkish (Muslim) town. the summer months. It is mainly popular with Turkish city dwellers from cities like Istanbul, Izmir, who prefer to stay in small boutique hotels or rent a room or small apartment in the town. There are daily boat trips to large Greek island of Lesbos which is rich in Antique history just as the whole Aegean area. Troy, Pergamon, Mount Ida, are few of the famous places from Antique Greek times which are within a short driving distance from Ayvalik. There is also a nearly 30 kilometres long sandy beach nearby but I have yet to explore the Ayvalik side of it. 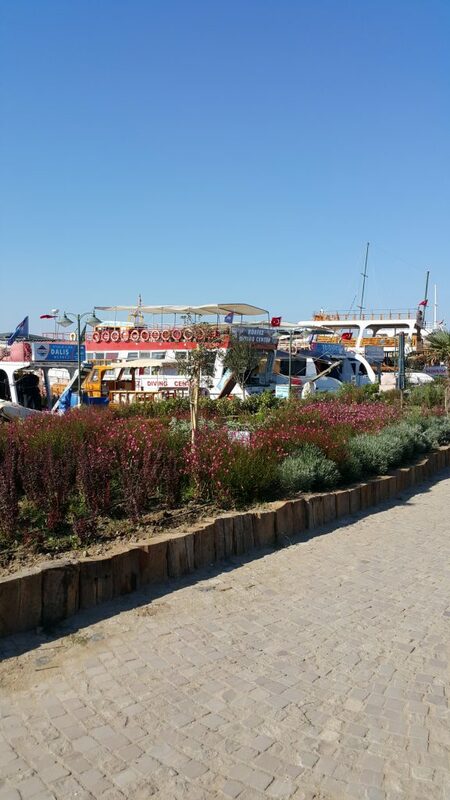 I have, however, visited the small island of Cunda. One summer day Tolun offered to take me to some quiet spot for swimming. He loaded his bike in the van and off we went. 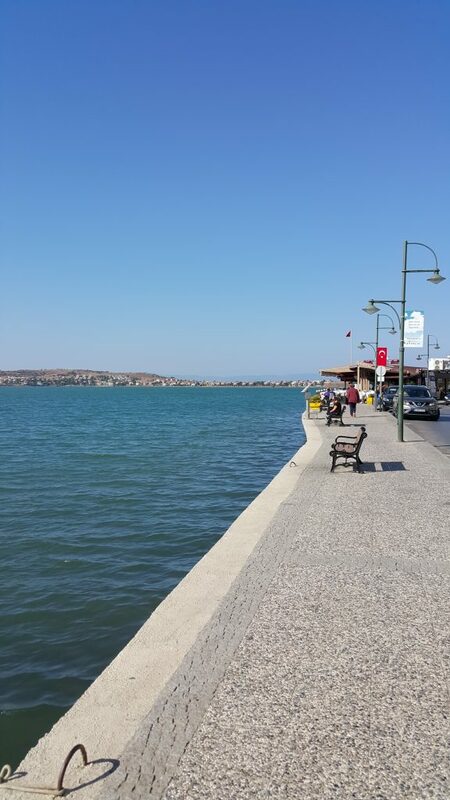 We drove to Ayvalik and from there, crossed the bridge and landed in Cunda. 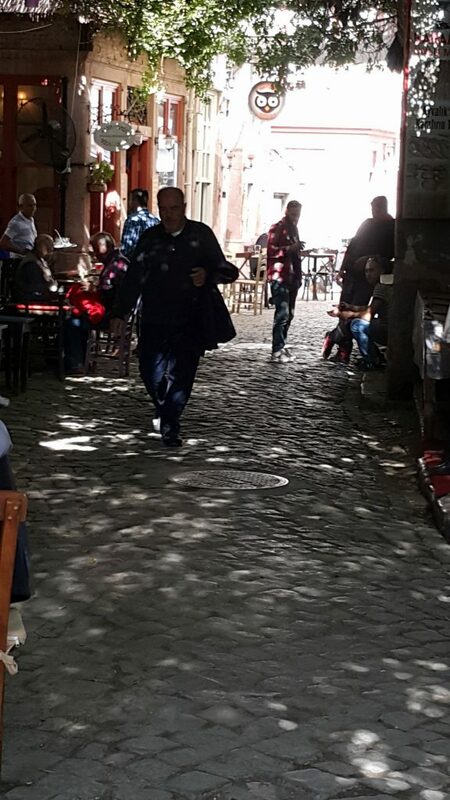 Then we passed through the main street where I couldn’t resist stepping into an antique shop, filled with probably Ottoman as well as post-Ottoman furnishings and porcelain. But back to olives. 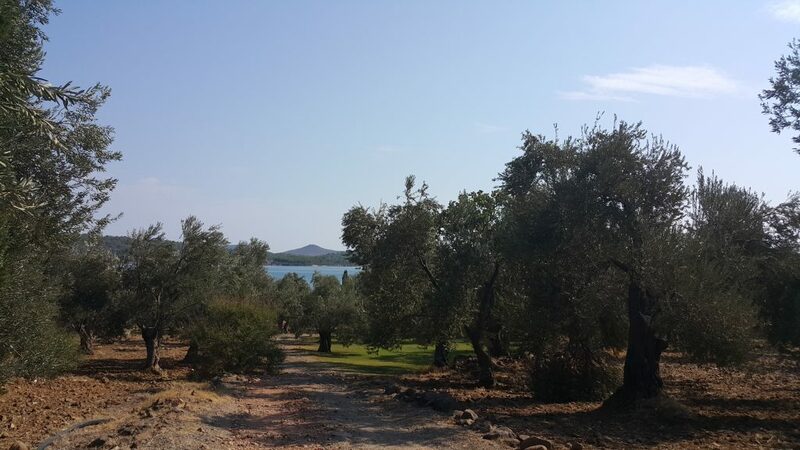 Ayvalik and its surroundings are known for high quality olives and as an olive oil producing area. We, too, stopped at one small shop and bought a bottle of locally made superior quality olive oil. We also sat at the spacious red brick walled cafe, converted from the old olive oil factory, the chimney still intact. So it is not surprising that you can buy many olive based products here, including soaps and beauty products etc. In Turkey generally, it is usual to see many varieties of differently prepared olives in grocery stores, supermarkets, bazaars. To me, they all taste great, but Turks themselves make the differerence between good and not so good olives. And what better place than Ayvalik to be acquainted with some great quality olives and everything else that can be produced from it! I have visited this gorgeous ancient Greek city twice – both times in the middle of the summer. It is also one of Tolun’s favourite old Greek cities, and he has seen a lot of them. 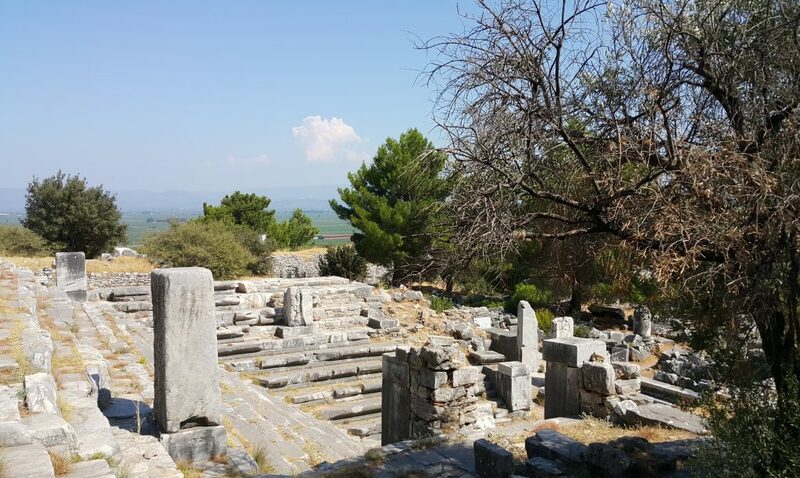 In order to reach this Ionian town, built in its current location in the 4th century BCE, located 35 km south from Ephesus, one must climb up the hill via stone pathway, which can be quite a challenge in the scorching sun. Once up the hill though, there are plenty of pine trees, offering a welcome respite from the relentless heat. The whole city is a cute compact size, easily explored by foot in the shade of the trees. It was not a big or politically important city, it is estimated that the number of its inhabitants didn’t increase beyond 5000 or 6000 people. Nevertheles, it was a beautiful and wealthy place, full of Hellenistic architecture. 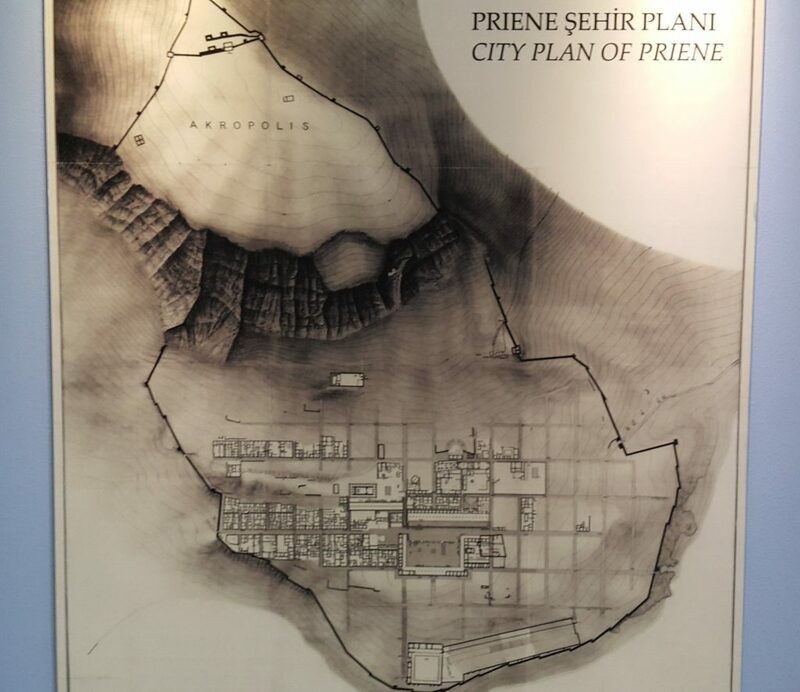 The city was carefully planned, as Alexander the Great himself and the local satrap Mausolus intended it to become a model city. It consisted of four main areas – cultural, commercial, political and religious. The cultural part of the city enjoyed the beautiful theatre, commercial area located the marketplace – agora. 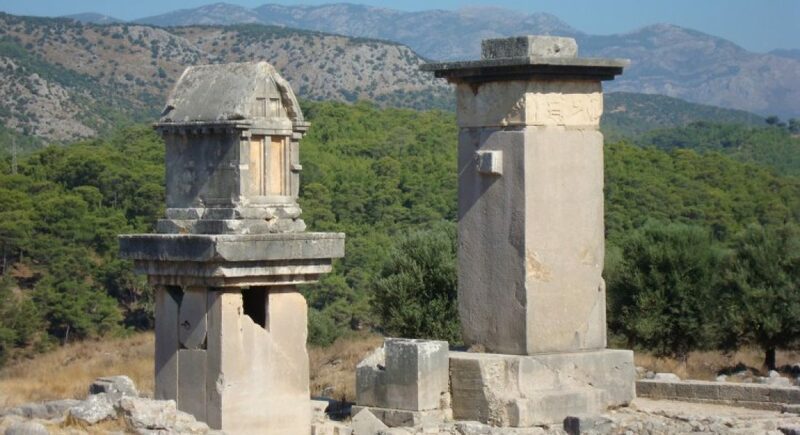 Political area housed bouleuterion where city council met and took their decisions about daily life and laws of this democratic city-state. 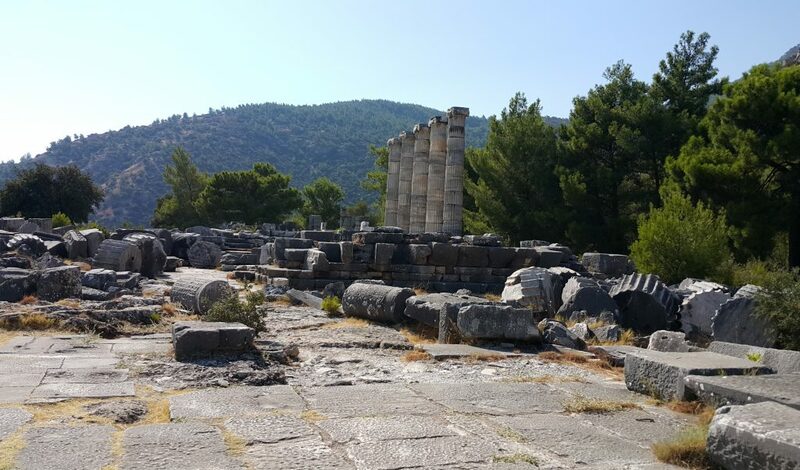 The most important building in the religious area was a temple dedicated to Athena and financed by Alexander, and there were also sanctuaries dedicated to Zeus and Demeter. The views both up and down from the city are spectacular. Looking down at the edge of the city, I enjoyed the panoramic expansive vistas across the plains and the Meander river, although the original views were over the sea as the city was built on the slopes along the seashore which now has retreated for over 10 kilometres away. Looking upwards from the city streets I was awed by the huge rock cliff looming just above the town. 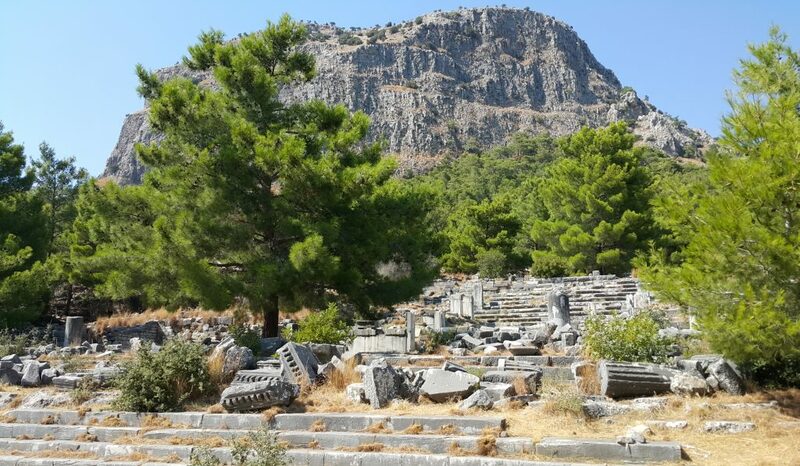 The citizens of Priene were very lucky indeed to live in such a aesthetically pleasing place. But not only the natural settings are spectacular here, the city itself is remarkably beautiful, built of marble from nearby Mount Mykale quarries. It has paved roads and wide streets, with sewage systems built underneath to keep the town clean and tidy, the carved stone benches and statues flanking the main streets, not to mention the intricately ornamented marble columns around temples and theatres and agoras. The people of this city were wealthy, due to its then seaport location. Many of the private houses were built of marble, had indoor water and toilets which were not common in those days. Most of the marble public buildings were also built with the money from the wealthy citizens.